In the modern work environment, in the office or at home, we like to count on the functionality of the devices we use. Also, the keyboard which we use a lot every day , should not only be durable but also have a number of functions to facilitate our work. According to this idea, the brand Natec developed the jellyfish model. Natec jellyfish keyboard has a number of functions that are developed to provide maximum convenience. Keys with so-called high jump guarantee the accuracy of operation which affects the speed of execution of tasks. Folding legs allow you to adjust the height to your needs and the white LED backlight gives us the opportunity to work at any time of the day. An additional advantage is the use of 12 function keys (F1 - F12), which facilitate the use of multimedia. 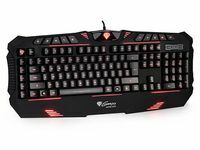 In addition, the keyboard has the function of the Windows Key Lock, known from the equipment for the players. This is a very useful feature, which protects us from the emergency exit to the desktop during e.g. fast typing and accidental pressing of the "key with the window." The keyboard has a USB connector so it can be connected to most modern equipment.